Our bodies are the vehicles that we use to interact with the world, and we want them to function as well as possible for as long as possible. We can’t flourish unless we are at our physical best, but that doesn’t mean that we need to be able to run a marathon or lift 100 pounds. We just want to take care of our bodies and do the best we can with the ones that we have. Even though I have a very healthy lifestyle, this is the pillar of Kathy’s Bloom and Flourish Model that gives me the most trouble. People who don’t know me well don’t realize this because I look and act healthy. Here’s what I do to maintain the health that I have. First, I eat very little sugar. Soft drinks make me feel truly ill now. Once you have broken the sugar habit, your body objects loudly when it gets a good dose. Candy bars are out of the question! Sugar is the devil! It feeds cancer cells and messes with your mood. It is highly addictive! If you drink soft drinks and/or eat sugary things like candy bars, stop! Spend all of your willpower on stopping that habit before you move on to accomplish one other thing! Now that doesn’t mean that you never get anything sweet. I eat organic dark chocolate every day. I don’t believe in a life of depravation. I believe in a life of moderation in all things – including moderation. I also like pie, and I keep Fudgsicles in the refrigerator, but I don’t eat both on the same day. Actually, I eat a lot of the things that you aren’t “supposed” to eat, like butter. I drink whole milk. I believe that eating food that is closest to its natural state is best. Here is one of Kathy’s hypotheses. I don’t have research to back it up. People comment all the time on how young I look. I’m 57 and am often taken for being a decade younger. I think one of the reasons is that I am not on a low-fat diet. Our skin and brain need fat! If you have been on a low-fat diet for a long period of time, I believe that you are starving both! In my world, it’s about moderation, not elimination. Limiting portion size is the biggest help for me. I got the idea from John Travolta. It was years ago that I read an article about how he lost weight for a part. He said that he cut all his portions in half. If he got a cheeseburger, he cut it in half and only ate one half of it. I thought that was a brilliant idea! Once again, life is short, and I’m not into deprivation. Eating less of things that I love doesn’t feel like a sacrifice. I feel better after a meal if I haven’t had too much. I know that talking about diet sodas with people usually has the same effect as if I walked up to a wall and banged my head on it, so I will be brief. At least don’t give aspartame to growing children. Please! It is a horrible chemical that no one should put in their body. As a general rule, real food is better than processed food. If the concept is new to you, a good book to read is Food Rules: An Eater’s Guide by Michael Pollan. It talks about how to shop in a grocery store and what to look for. Let’s talk about exercise. I believe that we all do ourselves and each other a disservice when we think that exercise must be hard. It doesn’t! 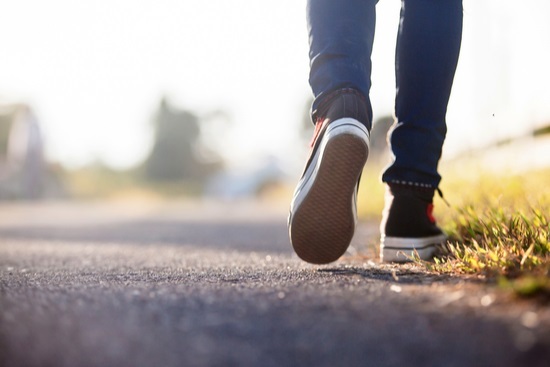 A 30-minute walk at a reasonable pace has lots of physical and psychological benefits. One study I read determined that walking is more effective at alleviating depression than drugs. What is important is that we move! I’m limited in what I can do. If I break a sweat while exercising, I’m down on the sofa for a few days with nausea and fatigue. However, if I never exercise, I can’t do everyday things like carry groceries. For me, it’s a balancing act. I do short bits of exercise throughout the day when I am home and try to walk as far as I can most days. I had brain surgery in 2009, and I’ve never totally recovered. I am grateful to be alive, but having physical limitations is frustrating! I find it especially difficult to watch friends ski and hike on Facebook. If you have physical limitations for any reason, you are not alone! There are a lot of us, but we don’t speak out that often. No one wants to dwell or complain, so we sort of suffer through silently while the runners around us extol the benefits of 10-mile runs. Don’t let it bother you! In life, what’s important is that we do the best we can with what we have. If you can only walk to the mailbox, walk to the mailbox. We need to push our own individual limits so that we maintain our own best levels of fitness. We get to decide what that is! I have a 15-pound weight on my bathroom counter. Every time I go to the bathroom, I do some repetitions with it. I do this because I want to be able to lift my granddaughter, who is about seven months old. I lift three-pound weights up over my head so that I can put my carryon bag in the overhead bin. For me, it’s about maintaining my ability to do everyday things. No matter where you are, it’s ok. If you are running marathons, good for you! I’m impressed and inspired by you. If you are walking to the mailbox, and that is your best, I’m impressed and inspired by you, too. The last thing I focus on is stretching and easy abdominal exercises. I feel so good after some gentle stretching! It improves my mood and makes my back feel great. I love being able to turn my head and not have my neck feel tight. Gentle abdominal exercises keep my back from going out. One summer when I was in high school, my mom and I went through Richard Hittleman’s Yoga: 28 Day Exercise Plan. It’s still available. The pictures and perspective are very outdated, but the exercises and concepts are timeless. I pull out my tattered copy and go through it now and then. My mom passed away a long time ago, but I feel she’s with me when I’m doing the exercises. It helps to feel that someone is with you. I am with you! When you resist sugar, I am cheering you on! When you are walking, I am walking with you. If you don’t want me, talk to someone else – real or imagined. Life is a journey better taken with others. Of course, I’ve only talked about a few things out of thousands that you can do for your health. I’m writing from my experience and the things that help me the most. You are different and unique! You get to focus on the things that help you. You may already eat healthy and exercise. What’s important is to maintain and support the one body that you have so that you can move about in this world with as much ease as possible. Each pillar of Kathy’s Bloom and Flourish Model supports the other. Some of the techniques that we will talk about to develop a positivity spiral have an enormous positive impact on our health. Physical health isn’t something we achieve and then forget. It requires a healthy lifestyle and daily movement. My email is below; let me know how you are doing! If you want to share on social media, let’s use #healthiestme. If you have a favorite tip or technique to stay healthy, share it with us in comments. We can do this!